They say that one man’s trash is another man’s treasure and this is especially true for one man in Brazil. 23-year-old Amarildo Silva of Campina Grande, Brazil began brainstorming ways that he could make some extra money for his family. Luckily, Silva was already quite the craftsman and had a knack for creating something new out of materials that people no longer needed. 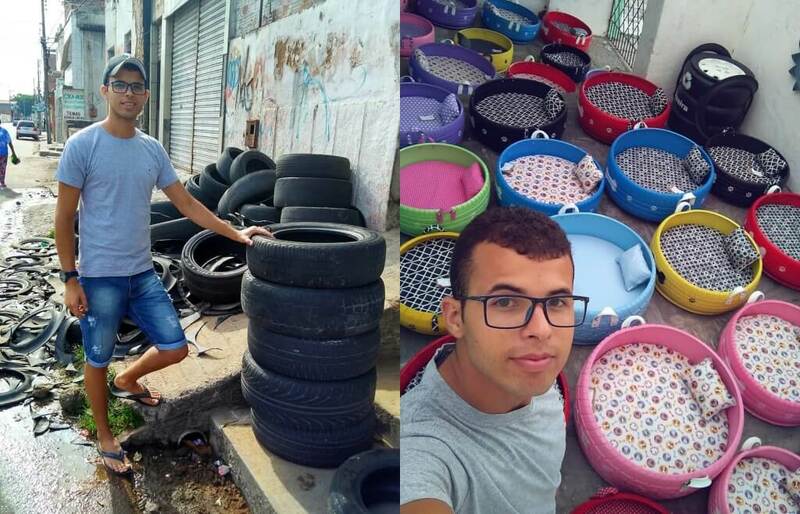 Silva was walking in his hometown one day when he noticed that among the litter in his streets, there were plenty of unused and worn out tires. Even more interesting was what he noticed inside them. Upon closer inspection, Silva realized that many stray dogs would use abandoned tires as makeshift shelters. It was then that he had an idea. Using his crafty skills, Silva collects many old tires off the street. He gives them a good wash before giving them a fresh coat of paint. After cleaning the tires, Silva outfits the tires with little beds for animals to sleep in. He initially did this to help the stray dogs and cats feel more comfortable, but soon realized he could make a business out of it! Now, Silva spends his days creating tire beds for people’s pets and it has become a huge success. His business, Cãominhas Pets, creates custom pet beds and has so far sold over 500 beds. This new business venture has not only helped countless pets and allowed Silva to make extra money, but his recycling the tires for a better purpose is great for the environment.